This does mean administrators have to create multiple bank accounts (one for each currency) and sign up for multiple payment gateways and possibly means more work pricing products. But it gives us full control over exchange rate fluctuations, gives a better experience for customers and is cheaper for them to purchase as they aren’t having to pay currency conversion rates on credit card payments. It is administrators responsibility to activate payment gateways which supports appropriate currencies. Every payment gateway can be configured what currencies it accepts. If invoice currency is not accepted by payment gateway then this gateway is not shown as an option for payment. Customers currency is set after first order. Once it is set it can not be changed. Customers can create new profile for account management in other currency. To add new currency go to Configuration > Payments > Currencies tab. You can add a new currency by clicking Add new currency. A pop-up window will be displayed where you will be able to select currency symbol (from the drop down box), display format and set the currency rate manually. Currency format can be easily change in currency management page. 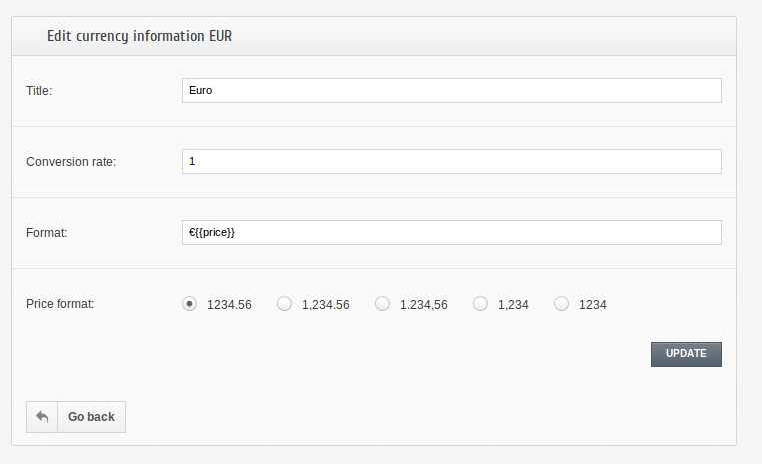 If you have trouble tracking the currency rate, or if you have multiple currencies in your panel, you can use the automatic currency rate update setting. It will update the currency rate automatically for all listed currencies. Just press Update currency rates button and it will be done for you.